Using the Reorder and Replenish Inventory features allow you to put inventory items on order that are below your low and high on-hand levels. In the Current Levels section of your home page you will see which items are below the low or high on-hand levels that you set for each inventory item. To reorder items, click the Reorder Now link. On the Add/Update Reorder page, you can adjust the Quantity and click Submit to put that item on order. 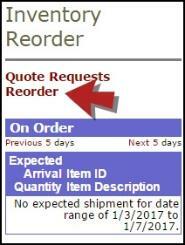 When the shipment for that item comes in, click on Reorder under the Inventory Reorder section on the right side of your home page. On the My Previous Orders page, click Receive Now to create a new Receiving Transaction for that item. You can also put multiple items on order at a time by using the Replenish Inventory Levels feature. On the My Previous Orders page, click on Replenish Inventory Levels in the shortcuts menu. 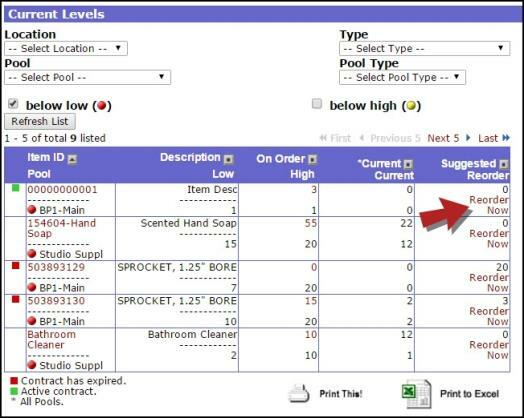 This will bring up a list of all items that are below the low and high on-hand levels you have set for each item. The screen will show 5 items at a time, you can click the Next button to show the remaining items in the list. This list can be filtered by Supplier and can be set to only show what is below your low levels, high levels, or both. *Note: Filtering by Supplier will show you all the items you may need to purchase from a particular Supplier. 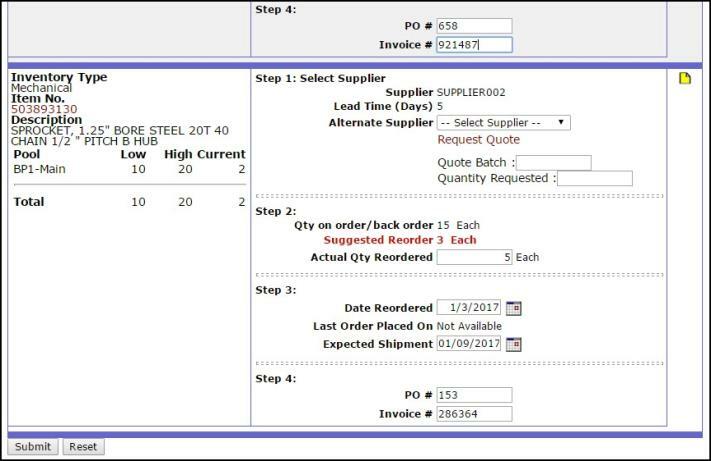 You can then reach out to your Supplier to purchase those items and then create orders in Inventory to track what you have to put on order. Enter the Actual Qty Reordered that you would like to put on order in Step 2 along with any other necessary information such as Expected Shipment, PO #, and Invoice #. You can enter reorder information for any of the items listed on the page and then click Submit at the bottom to save. When those items arrive you can create a Receiving Transaction by clicking Receive Now on the My Previous Orders page.